I must confess I am not a pancake and waffle mom. Unless of course said pancakes and waffles come from the freezer section. This morning I asked my people if anyone wanted a sweet potato pancake and my people firmly declined. Not to be deterred, I stayed the course, heated my skillet, added water, poured the batter and prepared to flip my pancake. I felt so Holly Homemaker. Except I almost burned the first one. Obviously there is a pancake learning curve. After my root vegetable creations were sitting on their plate, dusted not-so-lightly with powdered sugar, my little person wandered in to investigate. And conduct a taste taste (note missing pancake portion in above photo). And then politely ask for her own sweet potato pancake because they were the best things she had ever tasted. And then ask if I could make them for her before school too. I guess I will be a pancake mom after all. But only if they are sweet potato pancakes. 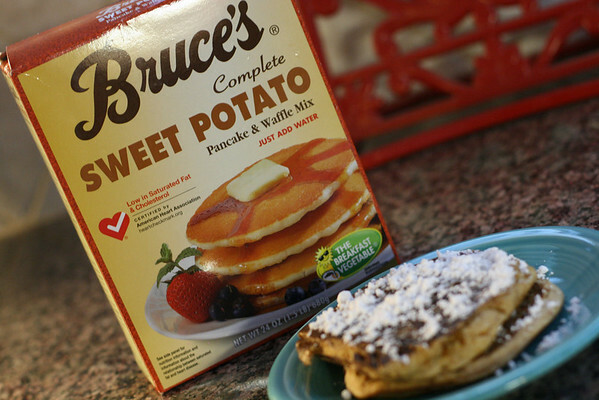 Have you ever eaten sweet potato pancakes? Would a griddle make for a better pancake experience? (I only have a skillet) Do you make pancakes often? I have not tried sweet potato pancakes but maybe I will. I make pancakes (from scratch!) every couple of weeks. I use a griddle so that I can make more at one time. Oh yes, girl! I have those and they are to die for! YUMMMM! Way to go Holly Homemaker! I am so not a pancake and waffle mom, but really should try to be one at least a few times a year right? But cereal is good too. YUM-O those look so good! A skillet is just fine- the griddle is fun, but a pain to set up just for a couple of pancakes... unless you are having a breakfast party! We have done that before for birthday parties- years & years ago. IT's awesome--kids come in pj's, breakfast food is cheap & the party is over early in the day - nice.